French bank Société Générale said its third quarter profits had beaten expectations with a 32% jump in earnings buoyed by a capital gain and higher overall revenues. Net profits rose to €1.23 billion, beating an average profit forecast of €917m in a poll of analysts by Inquiry Financial on behalf of Reuters. Société Générale said it made a capital gain of €271m as it updated the valuation of its stake in Euroclear. The bank said it has more than doubled the valuation of the stake, which is higher than 5%, in its books. Revenues during the quarter rose 9.6% to €6.53 billion, above the €6 billion expected by the analysts. SocGen's French retail bank also performed better than the previous quarter with a 1.8% revenue increase, while revenue from its fixed-income, currency and commodity trading division was stable. SocGen's stable performance at its fixed-income, currency and commodity trading arms contrasted with its French rivals BNP Paribas and Credit Agricole. Both banks said they had lost money on market trading even though they posted higher overall Q3 profits. 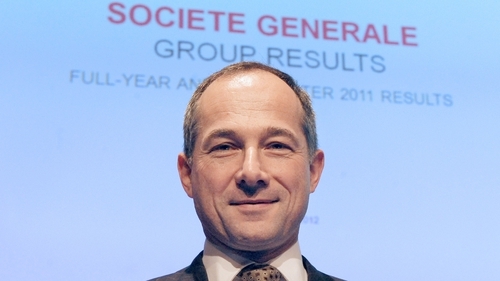 "Société Générale published solid results in the third quarter 2018 with a good level of profitability," the bank's chief executive Frederic Oudea said in a statement. Large European banks such as SocGen are struggling to boost profits as low interest rates hurt their traditional lending business, while new technologies and consumer habits are forcing them to spend heavily on overhauling their processes. SocGen also booked a €136m provision to pay potential settlements with US authorities, mainly over possible sanctions violations. SocGen had already set aside an amount of €1.1 billion to cover a possible settlement on this case. Oudea said in a statement that the provisions at the current level "put an end to the financial impact" of the dispute. Société Générale, which has been dogged for more than a year by a series of costly legal disputes, has regularly raised the provisions set aside to cover potential losses related to the settling of those disputes. The last case that remains to be settled relates to dollar transfers made on behalf of entities based in countries subject to US economic sanctions. In June, it agreed to pay $1.3 billion to authorities in the US and France to end the disputes over transactions made with Libya and over the suspected rigging of Libor, a key interest rate used in contracts worth trillions of dollars globally. As part of the process to settle the Libor case, Didier Valet, its deputy CEO in charge of investment banking activities, had left in March. SocGen already paid €963m in mid-2017 to settle another dispute with the Libyan Investment Authority.